Synesketch is an artistic software library (Java API) for creative visualization of textual emotions. Code is serving as a medium between words, emotions, and images; between poetry and painting. As the author states: "Synesketch is the Web's first free open-source textual emotion recognition and visualization engine - not just a closed academic research experiment - so that the whole community can benefit from it". 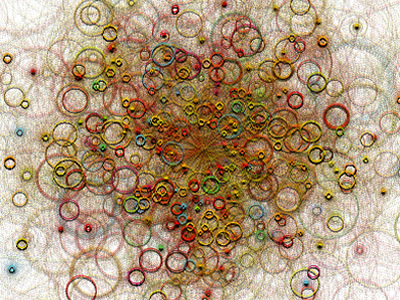 Synesketch is a result of a research that spreads out through diverse fields - from natural language processing techniques based on WordNet, across Ekman's research of emotions, to color psychology, visual design, data visualizations, and affective computing. Graphics were done in Processing and the name "Synesketch" is a portmanteau of "synesthesia" and "sketch" - where "sketch" does not only refer to drawings, but also to the Processing artworks usually referred to as "sketches". 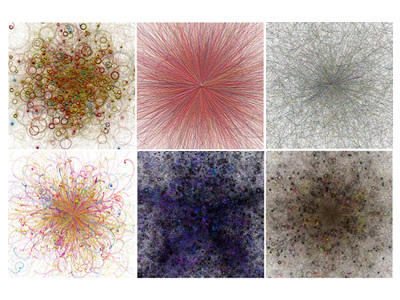 The first image shows six algorithmically generated images as a response to six basic emotions, defined by Ekman - happiness, anger, fear, surprise, sadness, disgust (left to right, top to bottom). The second image shows a detailed view of "happiness". For further details see the project's gallery.